The U.S. Food and Drug Administration (FDA) has now made public information regarding import refusals for February 2018. 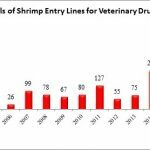 Last month, the FDA reported that 3 out of the 156 (1.9%) total seafood entry line refusals were of shrimp for reasons related to banned antibiotics. · Dalian Jinhui Marine Product Co., Ltd. (China), a company that has also not been exempted from Import Alert 16-131, had one entry line refused for shrimp contaminated with veterinary drug residues and unsafe additives by the Division of Northeast Imports on February 26, 2018. Also in February, the FDA reported refusing another eleven (11) shrimp entry lines because of salmonella, with all but one of these shipments originating in India. 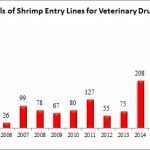 In January, the FDA reported refusing fourteen (14) shrimp entry lines because of salmonella, of which eleven (11) were attributed to Jagadeesh Marine Exports and were refused by the Division of Northeast Imports. Last month, the FDA reported refusing another nine (9) entry lines of shrimp from Jagadeesh Marine Exports, this time all refused by the Division of Southeast Imports. The other entry line of Indian shrimp refused last month was from Hyson Logistics and Marine Exports, a company that was added to Import Alert 16-81 (“Detention Without Physical Examination of Seafood Products Due to the Presence of Salmonella”) on February 20, 2018. The manufacturer of the only non-Indian shrimp entry line refused for salmonella was Rosemco Foods Limited of Bangladesh.